I did the next logical thing I could think of. I read the manual. Huh. I might as well have read it in French because it did not make a lick of sense to me. Then I thought I would just “experiment” with the manual settings…eep. I was definitely experimenting…every shot I got was blown out, blurry, or super under exposed. Sheesh. This stuff is hard. So, then I did the next logical thing I could think of. I switched it back to Automatic and went on my merry way. 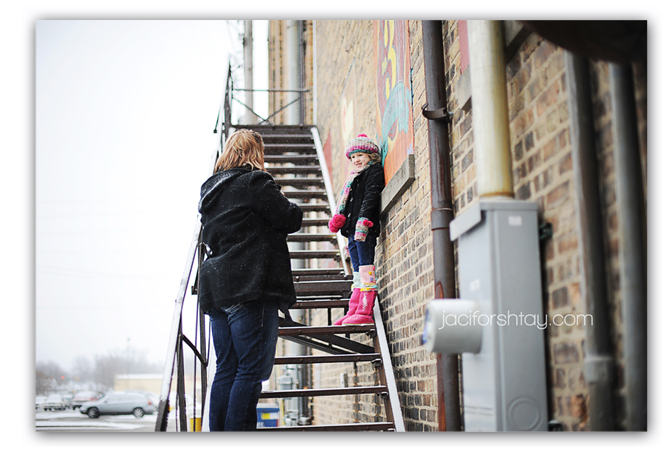 What I want to share with you today is about my first Mamarazzi Camera Mentoring session with Nichole! She contacted me about wanting to learn how to shoot in Manual. Bless her heart, *on her birthday* she drove a couple of hours to meet me at my local coffee shop and spend the morning with me! Little ole me! We chatted about how we fell in love with photography, what her photography goals are, all about the different settings and verbiage, and then gave her the opportunity to practice her new knowledge on a model, Miss Ava. Here’s a shot of Nichole (and Ava) in action! I was able to see some of the shots she took of Ava that morning…they turned out fantastic! !